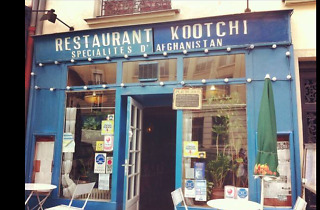 Kootchi is the kind of place that makes an instant visual impact while remaining discreet. The alert pedestrian will pick up on its curious name and brilliant blue façade, studded with lightbulbs and fronted by a tiny two-table terrace. Inside, the exoticism continues with the wall-mounted Middle Eastern carpets and elaborate lacework. You might as well have stepped into a Kabul teahouse. To most, Afghan cuisine is a terra incognita of meats, yellow rice and obscure spices. 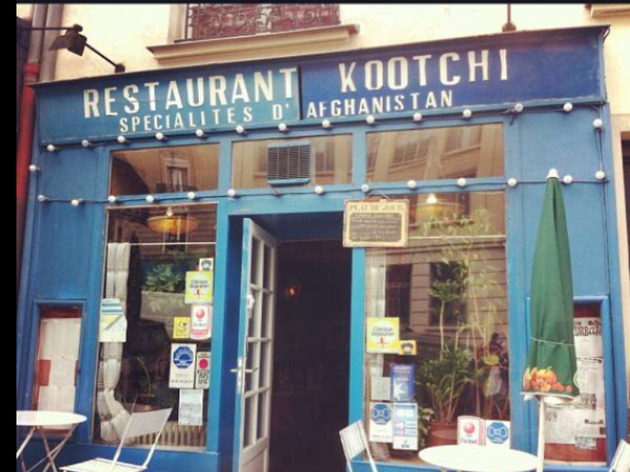 Which is precisely what you get at Kootchi: hearty, unpretentious food that fills your stomach while tingling your tastebuds. Shared platters are the done thing here – ask for a variety of rice, meat and veggie dishes, order a doore (a wonderfully revitalising drink of yoghurt and cucumber) to wash it down, and the kitchen will take care of the rest. You'll get the best deal at lunchtime, when set menus drop to €9–€12; come dinner, you can expect to spend up to €30 à la carte.